The job sheet file records individual entries and budgets against jobs. It is only available if the Enable Job Costing and Time Billing job preference option is set. The entries are displayed in a standard tabbed list view. Entries against a job can include resources used such as time, disbursements, stock and products. These can be actual or budgeted amounts. Actual: All actual job sheet items (both Pending and Processed). Pending: All actual job sheet entries that have been entered but not invoiced. Processed: All actual job sheet entries that have been invoiced to the client. Budget: All budgeted job sheet items. Actual job sheet entries can be entered into any of the Actual sidebar tabs, or can be created automatically when a transaction tagged to a job is posted. Budget job sheet entries can only be entered in the Budget sidebar tab, or created automatically when a Quote is accepted as a Job — see When a quote is accepted. The Job Sheet Items file will be displayed. The Job Sheet entry window will be displayed. The job description will be displayed, and any selling Sticky Notes associated with job will appear. If you enter an invalid code the choices window will be displayed, allowing you to select the correct code or create a new job by clicking New. This can be any class of product that you sell. The item description, sell unit, memo and the pricing details will be displayed. This field must be filled in for every job sheet entry. If you enter an incorrect code, the choices window will be displayed. Select the correct item by double clicking, or click New to create a new product. Note that the item’s barcode can be used instead of its code. If the product is a stock item, a message is displayed in the window and special action is taken by MoneyWorks — see Stock requisitions. Note: If you have Location Tracking turned on, a Location field will be available to enter the location from which the stocked item was taken (leave empty for the default location. Similarly if you have Serial/Batch tracking enabled a Serial/Batch field will be available for the serial/batch number of the serialised inventoried items. This is the date that the resource was used on the job. The analysis field can be used for whatever you require—e.g. the initials of the person whose job sheet is being entered. Note that this and the Activity Code field can be controlled by Custom Validations. Unless associated with a custom validation, this is a free form code. The cost centre must be a valid department code. If the Income Account when Selling field of the item is set to a departmentalised account, this department will be automatically entered into the Cost Centre field. This defaults to the description of the resource entered. It can be up to 255 characters long, and is a description of what the entry is for. 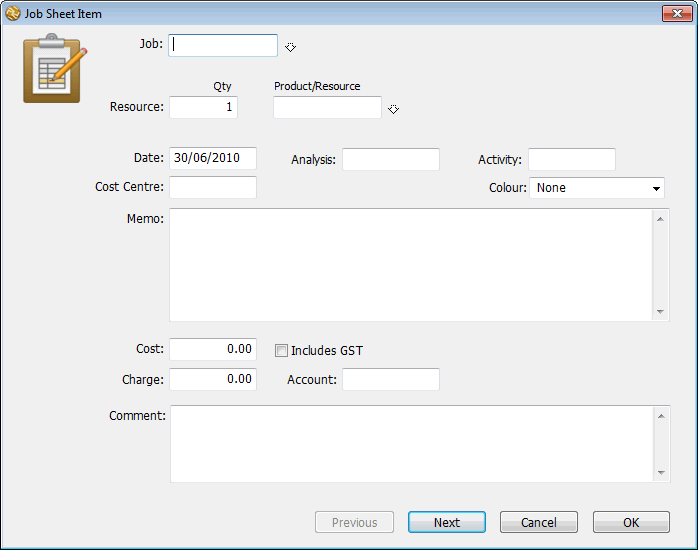 It will appear on the invoice if the Itemise in Description option is set in the Bill Job window. The Cost, Charge and Account fields will be filled out automatically for you based on the resource used, and can be altered if required. Costs and charges are always assumed to be in the local currency. This is for internal use only, and will not appear on any invoice. If Cancel is clicked, the entry is not saved. A pop-up menu with configuration options will be displayed. The field will be blanked between each new entry.